What to expect from Trump's second year as US president? Exactly a year ago, Donald Trump took office as President of the United States . Its first 365 days brought some controversial actions, such as the recognition of Jerusalem as Israel's capital and a major battle for the passage of an anti-immigration decree restricting the entry of citizens from mostly Muslim countries into the country. However, 2017 turned out to be less troubled than expected - largely because many of Trump's decrees were either barred by justice or needed extra legislation, which was not implemented. The US Congress passed few measures, and to the relief of many, some of Trump's biggest electoral promises were not honored, such as building the wall on the Mexican border and expanding laws favoring arms carriers. On his first anniversary as president of the United States, his approval fell and the American population became less optimistic . According to a recent survey, 39% of the population approve their performance, against 57% who disapprove of the president. In February 2017, shortly after the inauguration, Trump's approval rating was 44%. However, another three years of government are yet to come. For US policy experts, 2018 may be decisive for Republicans, with midterm elections taking place in November. The investigation into Russian interference in the 2016 race and the constant discussion in the American press about a possible impeachment also promise to take the president's sleep. While the first year of Donald Trump was marked by the president's unpredictability, the second year has been marked by previous experiences. To mark the anniversary, VEJA talked to American political scientists and gathered some of the top prognoses for the second year of the Trump government. The result you check below. Trump must continue to make his controversial and explosive statements in his second year in office. "There is no question about it, he can not contain himself," says American political analyst Kyle Kondik. In foreign policy, targets should remain North Korea and Iran - Trump's intimidating statements, however, they only got threats in response. There is concern in the international community that with yet another year of provocation, the reactions of certain regimes will become more violent and practical. Many also fear the Republican's behavior in the face of major international crises that would require interventions from the United States. "I think it's reasonable to be skeptical about the president's ability to deal with problems confidently," says Kondik. Elections that will decide the new House of Representatives, part of the Senate and the government of some states are scheduled for November 6. "Certainly the Democrats will win more seats in Congress and perhaps end up significantly with the Republican majority in the House," predicts analyst Kyle Kondik. In addition, the Democratic Party must win more state governments than it currently holds - Democrats rule only 17 of 50 US states at the moment. The vote is heating up the day to day Republicans in Congress and, consequently, Donald Trump. MEPs and senators should try to speed up some draft legislation and perhaps even agree to work with Democrats on controversial issues such as the DACA Immigration Act. "But the party is divided when it comes to major legislative issues," says University of California, Berkeley, Eric Schickler, professor of policy at the University of California.However, so far the vast majority of Republicans in Congress remain close to Trump , ignoring its low approval and controversial statements. "A key point will be whether they will continue to support the president when they face a difficult election environment for the November elections,"
Research into Russia's interference in the 2016 presidential elections and meetings between members of Trump's election campaign and Russian officials is expected to have new chapters in 2018. Rumors have recently surfaced that controversial former White House strategist Steve Bannon would be called to testify before Robert Mueller, special adviser assigned to the case, have warmed the scene. A report of completion of the investigation may directly shake the government and the president's popularity. Nothing is yet known about Mueller's conclusions, but the issue should continue to disrupt the White House. "If the investigation is released mid-year, it could have a major impact on the November elections, especially if there is evidence of some kind of collusion between the Trump campaign and Russia," says the political scientist and professor at the University of Wisconsin, David Canon. Since the investigation into Russian interference in the elections has begun, the 'ghost' of impeachment rounds out the government of Donald Trump. Although no indictment has been filed against the president himself since the resignation of FBI director James Comey, the matter has been a constant subject in the American press. Although an impeachment is unlikely at this point, the subject tends to remain on the radar of American voters and legislators. In order for the impeachment process to take place, both the House of Representatives and the Senate would have to consider the president guilty of the crimes for which he is accused and approve his dismissal with at least two-thirds of the House's votes. Since taking office as president, Trump has divided the United States with his nationalist rhetoric. 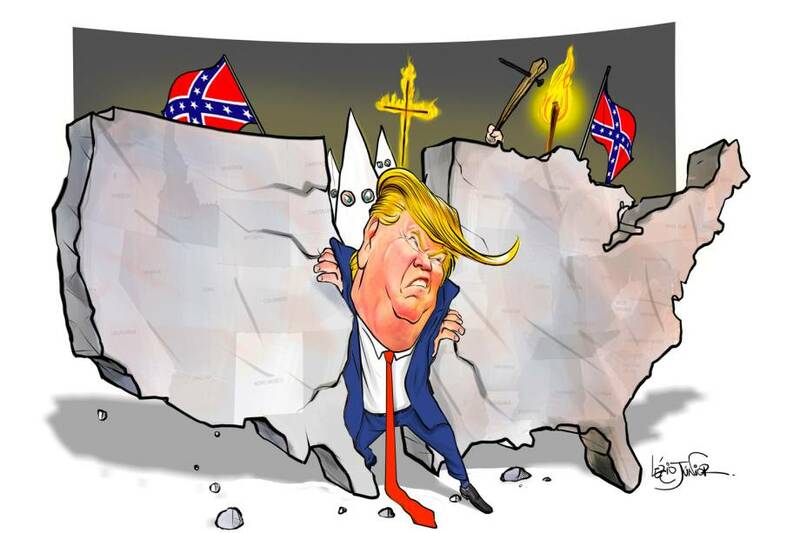 Racist and xenophobic movements gained momentum and spurred episodes such as that of Charlottesville, Virginia, in August, when racist and anti-racist protesters clashed , leaving three dead and dozens injured. "He is the president of the United States, the most powerful man in the world, and his attitudes allow racist, sexist, xenophobic and homophobic people to come out of the dark and say what they mean," says political scientist Christopher Parker of the University of Washington. The professor believes that these movements have always existed in the country, but they have been encouraged by the American president. The reality will likely remain the same in the second year of Trump's rule. With his controversial remarks, the Republican must further polarize American society, and the consequences can be serious. Even with the end of his rule, racist movements are likely to remain strong.